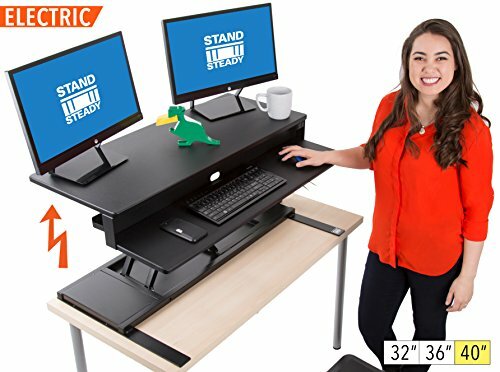 The FlexPro Power 40" Electric Standing Desk is the electric stand up desk converter you've been searching for, with a 2-level design, including monitor and keyboard levels, plus a simple button to push when you're ready to sit or stand! You've heard the stories about sitting disease, and have thought about getting a standing desk. So many people who use a standing desk report that they have extra energy, less fatigue and less back-pain. Now it's your turn - clear off your desktop and get ready for this awesome ELECTRIC height-adjustable sit/stand desk! ELECTRIC LIFT: 100% equipped with electronic power, which raises and lowers the desk with the touch of a button! TWO LEVELS: Large monitor surface plus separate keyboard level! HEIGHT ADJUSTABLE: Set the desk to your correct ergonomic standing height. FRONT LEVELING FEET: 2 front feet are height adjustable and twist to perfectly level the desk! CORD MANAGEMENT: 2 tabs located on back of monitor level keep all those cords in place! Height: Monitor height adjusts from 6.3 to 19.25 inches. Keyboard level adjusts from 1.3 to 14.25 inches. Assembly: No assembly required - arrives fully assembled and ready to use! ✔ IT'S ELECTRIC⚡: A simple push of a button will convert your desk from sitting to standing (or vice versa) in just seconds. Your desk will sit flat at its lowest height and adjust to 19.5 (that's tall!). Go ahead and boogie woogie, woogie because it's electric! ✔ TWO LARGE SURFACES: With a spacious keyboard level and monitor level you'll have one ergonomic desk solution! Our FlexPro Powers can fit your two monitors, your laptop, keyboard, mouse, tablets, snacks, collection of bobble heads, and MORE! ✔ QUIET & SECURE POWER LIFT: Dependable power lift technology makes your new electric standing desk transition quietly and effortlessly. ✔ FULLY ASSMEBLED: We're here to make things easier for you - so it's already assembled with love and care. Just open the box, plug it in, and STAND. Look no further - you've found your standing solution! ✔ WATCH VIDEO: Instead of telling you - why not just SHOW you? Check out our video under the pictures!